The simple answer: they’re delicious. Hazelnuts are good by themselves, but they also complement the flavors of coffee, chocolate, cheese, meat, mushrooms, and all sorts of other things. They’re very healthy for you -- loaded with protein, vitamins, antioxidants, and omega 3s. They make great snacks, they can be made into hazelnut butter (it’s very hard to go back to peanut or even almond butter after trying it), and they can even be pressed into hazelnut oil. If you have any doubts at all about how awesome hazelnuts are, try making a pecan pie with chopped hazelnuts instead. Or try making a cream-cheese and hazelnut-butter sandwich. Hazelnuts will blow your mind. The more complicated answer: what tree crop can be grown sustainably, with few inputs, on steep terrain, which starts producing in only a few years, which is unique (but not unheard of), which can be turned in a wide variety of products, most of which can be sold at a good price for a farmer? There aren’t a large number of things fitting this bill, but the hazelnut could be one of them. I say “could be” because they’re not being grown extensively in the eastern US, and there’s no guarantee they’ll work. None of our trees are old enough to get mature yield estimates from. Mother Nature could definitely send us back to the drawing board on this one, because growing hazelnuts is a little complicated. The main problem -- historically, at least -- is that they’re susceptible to Eastern Filbert Blight (Anisogramma anomola). This is a fungal disease that spreads through the air. It’s carried by native American hazelnuts, which are mostly immune to it. The European varieties aren’t. They usually die. At least until recently. A number of researchers at Rutgers, Oregon State University, and several other schools have been working on developing disease-resistant hybrids, in addition to an existing (but small) pool of resistant cultivars that are commercially available. We’re not sure how many of these varieties will work in North Carolina, so we’re planting as many different kinds of hazelnut as we can, and hopefully we can start breeding new trees ourselves. Our goal is to either find or breed a variety that is suited to the unique climate and soil conditions of southern Appalachia. This isn’t going to be easy. 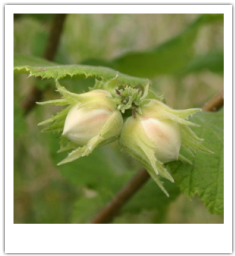 Each hazelnut orchard needs to contain a mix of different varieties. This is because hazelnut trees are self-infertile, so you need some of a different type to act as pollinizers. They’re wind-pollinated, not bee-pollinated, so placement within the orchard can be key. They also flower in winter, but the flowers can be killed by very cold temperatures. And different varieties bloom at different times. Planting a hazelnut orchard that works is very experimental. It might be less complicated than we think it is, or it might be near impossible for this climate. We just don’t know. But considering how awesome hazelnuts are, we’re willing to do the work to find out. At the same time, we’re not about to put all our eggs in one basket. That’s why we’re starting out with such a wide variety of different fruit and nut crops. We think growing a diversity of things will make our farm more resilient (both economically and ecologically) and, let’s face it, a whole lot more interesting to work on.